Good afternoon and Happy Summer to everyone! I wanted to take this opportunity (it's my turn to post today) to give you all some updates on who is reading our writing and just how far and wide we are reaching with our summer reading reflections. However, before I do that, it goes without saying that the writing, both by the teachers and by the students, has been terrific so far, and it shows your commitment to this project. Reading has always connected us to people, be they our friends or neighbors, schoolmates or parents, we have always used reading as a means to share information, ideas, breaking news, and our thoughts on the world around us. Through this blog, we've been doing what we've always done, only now we are making our thoughts available to a much larger audience. So, on with the statistics.. 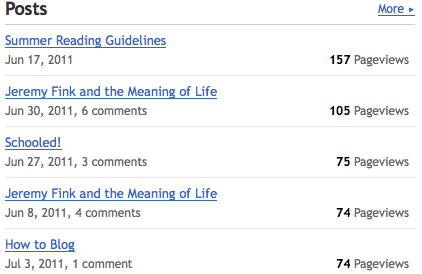 Above you can see the six most popular posts we have had since the writing officially began on June 17th. If you don't see one of your posts up there, give it time, some of these have been around for over a month! We have had visitors from ten different countries since we began, with over eight-thousand of them from the United States. Looking at this, I'd love to challenge you all to double this by the end of the summer, and to see how many different countries we can reach! Lastly, these are our total pageviews for the last month and for all time. A pageview counts as any time a web browser (like Internet Explorer or Firefox) loads a web page. These number are astounding! Your writing is being read by so many people far and wide. 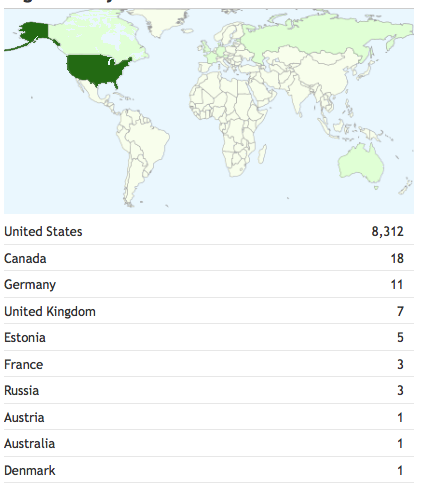 Increase the number of readers on our page to include people from more than the ten countries we have already. Keep connecting the stories to your own lives. Our posts with the most reaction seem to be those where the writer makes a connection between the book and their own experiences. Spread the word among your friends. The more people we have talking about our books, the better! !